New Bedford, MA (April 1, 2016) – New Bedford resident, Rita Robitaille recently celebrated her 100th birthday at Melville Towers – an apartment community featuring 320 residences located on Pleasant Street– where she has lived since 1984. 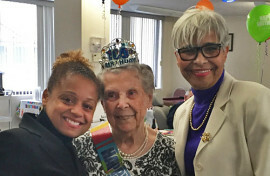 Ward Four Councilor Dana Rebeiro and Councilor At Large Naomi Carney joined Melville Tower residents for the birthday celebration, which included live music by Big Smile Entertainers, a luncheon, cake and ice cream. During the party Councilor Rebeiro and Councilor At Large Carney presented Ms. Robitaille with citations on behalf of the New Bedford mayor and the city council, acknowledging this milestone birthday. Ms. Robitaille was born and raised in New Bedford, worked for 32 years as a folder at the New Bedford Manufacturing Company and is very active in the Melville Towers community. She was married for 38 years to the late Armand Robitaille and has a daughter, three grandchildren and six great-grandchildren. Melville Towers is managed by full-service real estate firm Peabody Properties, Inc.
Pictured above (left to right): Ward Four Councilor Dana Rebeiro, Melville Towers resident Rita Robitaille and Councilor At Large Noami Carney.